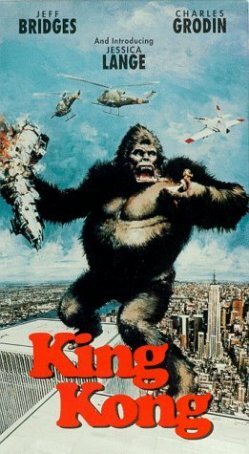 Common wisdom contends that Dino De Laurentiis' big-budget remake of Merian C. Cooper's classic 1933 film, King Kong, is a bad movie. And, viewed from a certain perspective, perhaps it is, but it's also a lot of fun. Certainly, this version of Kong doesn't have more than an echo of the original's magic associated with it. The same level of painstaking craftsmanship isn't apparent here -- instead of using stop-motion technology, we have Rick Baker in a monkey suit. But the 1976 rendition has a fresh, breezy feel to it. The screenplay, by Lorenzo Semple Jr. (Three Days of the Condor), is relentlessly tongue-in- cheek, and there's an air of self-aware campiness pervading the project. This movie certainly doesn't offend me like it does many lovers of the original. There are times when the '76 Kong is obviously very bad, but those are more than offset by the things it does right. Although the special effects (which really aren't all that "special") won an Academy Award, they're definitely not the type to impress, even though this is still (barely) the pre-Star Wars era. Semple's script, which effectively brings the story into the '70s, is an asset, as are the performances, which hit the perfect rhythm for this kind of cornball adventure. In the original King Kong, moviemaker Carl Denham (Robert Armstrong) makes a voyage to the mysterious Skull Island in search of something amazing to capture on film. In his company are his lead actress, Ann Darrow (Fay Wray), and a hunky sailor, Jack Driscoll (Bruce Cabot). Once they reach the island, Ann is captured by the natives and offered up to their god, Kong, a thirty-foot high giant ape. After a chase through a dinosaur-infested jungle, Jack rescues Ann, and Denham captures Kong. He brings his prize back to New York, but chains can't hold him. The ape escapes, re-captures Ann, then climbs to the top of the Empire State Building, where he meets his doom in a fight-to-the-death with biplanes. Forty-three years later, not that much has changed. The principals have slightly different names and roles. The "Denham" character, now named Fred Wilson and played by Charles Grodin, is a pompous oil executive in search of fabled petroleum deposits (this movie was made during the mid- '70s oil crisis). Jack Driscoll has become Jack Prescott (Jeff Bridges), a long haired anthropologist who is looking for Kong. And the girl is Dwan, played by Jessica Lange in her screen debut, a starlet looking for a little love and a change of luck. The plot has this group landing on the island in search of oil, and, instead, finding Kong. The finale in New York takes place not at the Empire State Building, but atop the World Trade Center, where Kong battles not only helicopters, but men armed with flamethrowers. Admittedly, there are times when Kong looks pretty silly. However, for the most part, the concept of Rick Baker in a monkey suit works pretty well. Then there's a life-size, mechanical representation of the ape which gets about 10 seconds of screen time (during the New York escape sequence), and appears as stiff and ridiculous as any failed special effect can. Some of the blue screen shots don't work -- specifically one where Dwan is pounding on Kong's nose. The editing is also rather clumsy. After Kong destroys one of the helicopters in the final battle, the same number are subsequently shown circling him. It's not all bad, though. In fact, taken in the right spirit, a fair amount of what this updated King Kong offers is quite good. The romance, such as it is, between the male and female leads is developed more fully here than in the '33 version. Ditto for the "relationship" between the humanized Beast and his Beauty. Ann always hated Kong; Dwan, on the other hand, tries to save him and weeps when he dies. There's a cute moment in the jungle where Kong uses puffs of breath to blow dry a soaked Dwan. And there's a welcome transition sequence between the island and New York scenes on board the oil tanker transporting Kong to America. From a cinematography standpoint, King Kong impresses. Much of the location footage is epic in scope, especially the scene where the initial motorboat penetrates the fog bank surrounding Kong's island. The sacrifice scene, which leads up to Kong's first appearance, is nicely-choreographed, and builds suspense. John Barry's score, which is excellent at establishing moods, is among the most overlooked work of his career. Semple's script contains numerous witty lines. The performers all ham it up, having great fun with their parts. "Serious" viewers may have difficulty with this style, but, for a movie as fundamentally silly as this one, it works (in fact, it's probably the only reasonable way to play things). Sure, this King Kong remake is loaded with flaws, but, in many ways, they add to the campy charm. De Laurentiis' Kong may not be a grand, glorious modernization of a classic tale, but it's two-plus hours of big-scale, occasionally-foolish entertainment.